Kangaderoo Custom QR Code. : Wrapping up Custom QR Codes. Wrapping up Custom QR Codes. Quote from the movie Live and Let Die: "Do you think you could gift wrap it for me, please?" 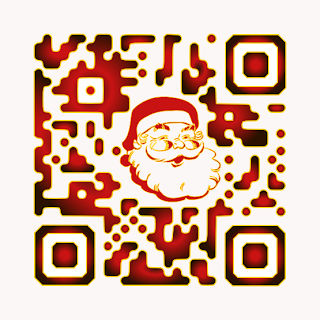 When enhancing QR Codes it seems every day is Christmas. The gift it the content in the QR Code and the enhancement is the wrapping. When selecting your Christmas gift, the nicest wrapped gift gets selected first. With this philosophy in mind the better looking QR Codes will probably be scanned more often than the standard QR Codes. Just like with Christmas gift, the important part will be the gift itself. If the gift is disappointing it doesn't matter how nice the gift is wrapped. At the end the gift is remembered, not the wrapping. And with too much enhancement of the QR Code the readability of the code can become compromised, you'll end up with a nicely wrapped empty box. If you require your own graphically enhanced QR Code, where the enhancement does not compromise the codes readability, please contact me or visit my site to check your possibilities with custom qr codes.Or just scan the nicely wrapped QR Code.